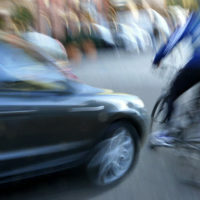 While bicyclists who fall victim to negligent motorists in an accident can clearly bring personal injury lawsuits to recover medical expenses, lost wages, and pain and suffering, many people do not realize that the bicyclist involved in the accident is often not the only victim in the accident. The victim’s family members always suffer as well, and can, in some circumstances, bring a wrongful death action when their loved ones are killed in bike accidents. In one recent case, a wife and mother of five was killed while riding her bike in the crosswalk section after she had activated the crossing signal. She was struck by a driver who was allegedly driving carelessly and negligently. While the wrongful death claim still has not been heard, at the traffic court hearing in October, the judge found that the driver failed to yield to a pedestrian in the crosswalk and reduce her speed to avoid an accident. As a result of losing their wife and mother, the family experienced severe grief, sorrow, and mental suffering, as well as medical and funeral expenses. Their two youngest children have special needs, thus, although no amount of compensation could ever make things right, it is especially important that the family has basic funds to make sure they are taken care of. Florida is no exception when it comes to bike accidents like these: A recent report released by the Centers for Disease Control and Prevention found that Florida has the highest rate of bicycle-related deaths in the county. At Friedland & Associates, our experienced Fort Lauderdale personal injury lawyers fight for the physical, emotional and financial compensation of the bicyclist and their family members. If you or someone you know has been injured or killed while riding a bicycle due to the fault of another, contact us today for a free legal consultation. We work with the very best experts to obtain the justice that you deserve.